It started with a fire. When the lovely wife and I were married back in 2000, we received a giftcard from Sears*. I still remember putting it together in our Milwaukee apartment with my friend Steve (Full disclosure, Steve did most of the work as I was as unhandy then as I am today). That grill moved with us to Las Vegas, and served us well for five years. When we moved back to St. Louis, the grill was going to be one of the last things on the moving trailer, but once we put it on, we realized we would have to pay $200 extra just to ship it back to Missouri. So it stayed in Vegas with my friend Mike, where it serves faithfully as a grill to this day! Well done Kenmore by Sears, well done. *Can you imagine such a gift today? It would almost seem like a punishment. Back in 2000, going to Sears seemed like a completely reasonable thing to do. Today, it would be behind Amazon, Costco, Target, Walmart, and Craigslist as my shopping destination. I kind of feel bad for it, since when I was a kid, the Sears catalog was still a big deal. I sometimes wonder what store that is huge now that will be an afterthought ten years from now. When we moved to Missouri I went to Walmart (moving down in the world), as I needed a new grill. I bought a Uni-Flame (ironically named) three burner gas grill with cast iron grates (fancy!) for $200. Then the igniter went out. I’d press the button, click click click click click click…nothing. No worries! I’ll just get the long handled matches and risk my hand and arm being horribly burned in lighting the grill with a trusty match. Another year went by as I gleefully spent the summer grilling meats with ease. One day in 2007 we invited some friends out to the farm for a barbecue. They are a family of five, so it was going to be a pretty big cook. If I remember correctly I was going to be making burgers and brats, so I wanted to get going early on the brats so they’d be ready soon after our guests arrived. I went out on our wooden deck, turned the knob on the gas, lit my match, stuck it down by the burner and watched the bright blue flame burst to life. I turned the knobs to start the other burners, when suddenly, I heard a soft crunching sound and looked down to find one WHOLE SIDE of the burner assembly had completely disintegrated. THINGS ESCALATED QUICKLY! Immediately flames started to pour directly from the tube connecting the grill to the gas tank at the bottom of the grill chamber. THIS IGNITED ALL THE GREASE IN THE BOTTOM OF THE GRILL. There was a little grease catcher below the main chamber and it burst to life like an unholy, disgusting goblet of fire. The ENTIRE grill was then ablaze. A Uni-Flame if you will…see what I did there…licked the interior and exterior of the grill with flames enveloping the whole grill as grease and gas burned in Uni-flame unison. The lovely wife was inside, and I immediately shouted something along the lines of “Oh Shucks!” Which brought her attention to the situation. I gingerly reached for the knob on my propane tank and turned it shut. I then waited for the grease to burn itself out. Once the flames died down, I closed the lid removing the oxygen supply from the grease inside, and I watched as the greasy goblet of fire merrily burnt on for several minutes. The grill was dead, and we still had guests coming in about a half hour. The lovely wife and I wondered what to do, and then I remembered we had what I had considered up until this moment a piece of junk sitting in our machine shed. The Weber Kettle Grill. It had belonged to my parents, and I had remembered it getting sparse use during my childhood. It now sat neglected in our machine shed, about 30 years old, and unused for AT LEAST 10 years, as my family had switched to Sweet Lady Propane as well. We had no charcoal, but I blazed down the highway to Walmart and picked up a bag as well as some lighter fluid getting home slightly before our guests. And so that night I began down a path that would drive me to near obsession. I cooked everything necessary on that old grill that evening. I knew nothing then of the vocabulary I know well know. One touch, Master touch, silver, gold, metal bowl handles, performer…all I knew was that I was cooking old school, and I liked it. 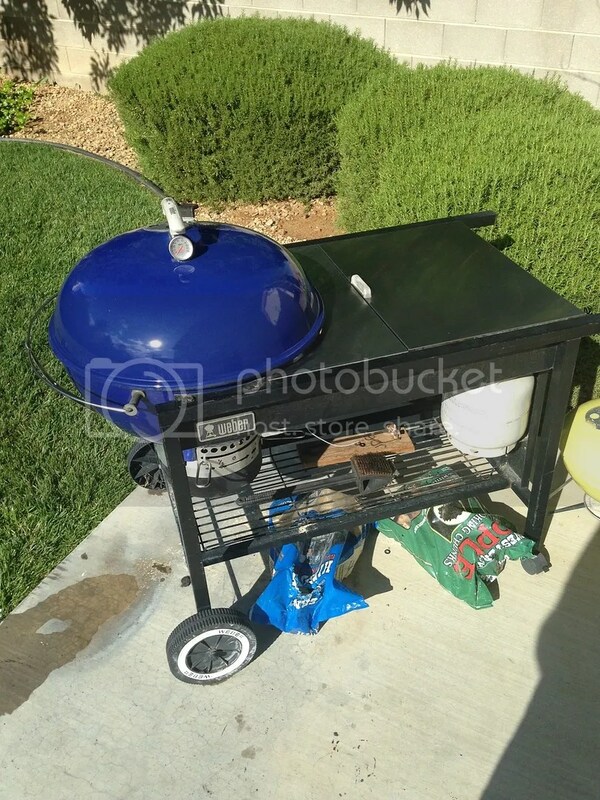 I searched high and low online for a picture of that grill, but THIS is the only picture I found with my first Weber Kettle, ironically still sitting next to the broken Uniflame it replaced. 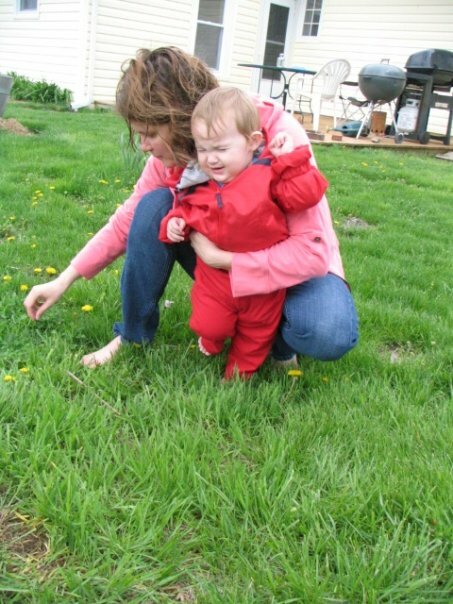 I have NO IDEA what is going on with this picture, but clearly my son either HATES dandelions, feeling grass, the gentle touch of my lovely wife, or the fact we still owned a Uniflame grill at this time. You notice my first Weber in the upper right hand corner. Ignore the child in the foreground who is clearly experiencing some sort of nature related trauma. I used that grill for the next two years and during that time I learned to love it. I bought a chimney starter (lighter fluid is the devil), and despite being hit by a lawn mower that bent the legs, that old Weber grill survived two moves before finally being put to rest upon the purchase of my Weber Performer Grill. For those who don’t know what the Performer is, it is the Lexus of the Weber world. It has a propane assist, meaning you start your coals with a propane flame, getting them piping hot in about 15 minutes rather than what can often be a 30 minute or more affair. It has a handy work table, an enclosed ash catcher, a bin to store your charcoal, and hooks for your tools. It is SO SWEET. It makes prep, cooking, and clean-up a snap. From 2009 to 2014, I used this grill exclusively. I loved it, but once again, a move was on the horizon, and shipping it would be costly. So I left it with my dad who has made use of it a few times since. IT SUCKED. Low flame, no flame, high flame, low flame. I hated it. I had succumbed to the supposed ease of the gas grill. After a month, I was pretty bummed. Then one day, my passion for Webers was rekindled. A Performer popped up on Craigslist for $50. I IMMEDIATELY called the guy and he delivered it to me that night for an extra $10. My new house suddenly became a home. The performer was from 1997, but it worked as good as new. Plus, it was an old style with the stainless steel table. The world was right again, and I was back to delicious charcoal grilling. **I’ve heard addicts defend their addictions…”I only use heroin on Wednesdays to get me through the week!” Sorry…no more heroin jokes. In total, I have spent $300 on all the grills. This is less than the cost of one brand new Performer, or about the cost of a low to mid range gas grill. 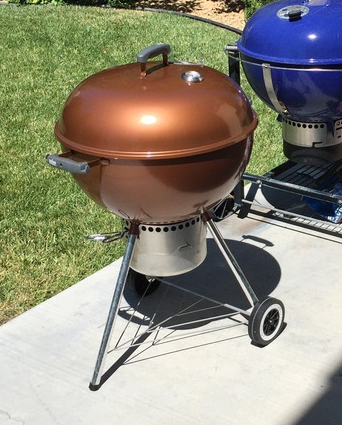 Weber grills are the grandfather of modern grilling. George Stephen was a frustrated father who wanted to do a better job grilling. In 1952 he cut a metal buoy in half from the Weber Metal Works where he was employed…the rest is history. If you enjoy grilling, you owe a lot to this guy. These grills last FOREVER. Porcelain coated stainless steel construction is basically weatherproof, and if you do have a problem with your bowl, Weber offers a 10 year warranty on the bowl itself. They are beautiful. I love the look of them. Simple, timeless design. They make awesome food. Grilling, smoking, making pizzas, these grills can do a lot of things once you get the hang of it. Although gas has its merits, burning wood or charcoal releases FLAVOR BLASTERS (there’s a science name for these chemical compounds but let’s just call them FLAVOR BLASTERS) that enhance the flavor of your food. The performer. This is my go to grill. I use it AT LEAST twice a week when I’m home. The cart is from 1997, but the bowl is from 2008. I got another friend interested about Webers and when another popped up on Craigslist with a blue lid, we went and got it. I chipped in $20 and I swapped out my black bowl for the new blue bowl. The 2014 copper One Touch Gold. These are still available in stores for $150. 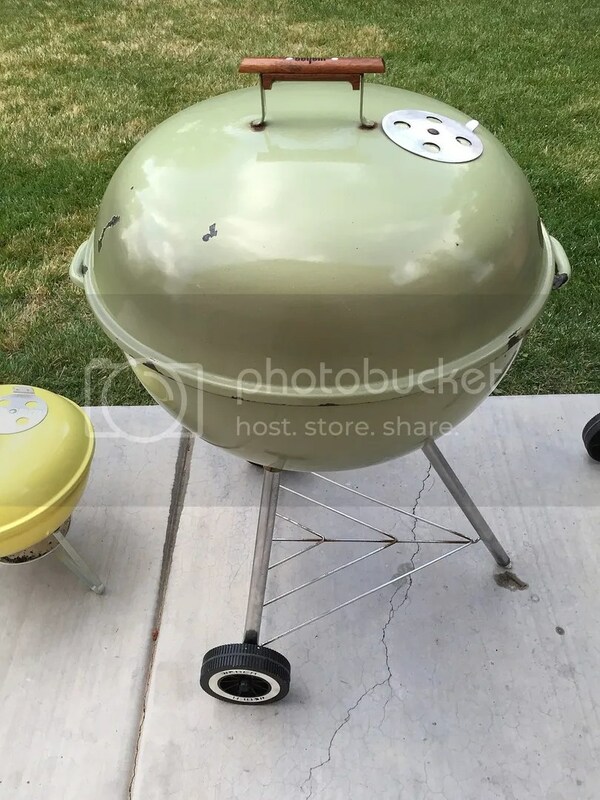 I got it for $40 this summer from a guy who was moving and had listed it on Craigslist as a “”BarbAcue BBQ”…which is why I think it was sitting on Craigslist for two weeks. This is the lovely wife’s favorite color. The Simpsons Smokey Joe. Made only in 1999 for the Simpson’s 10th Anniversary, some people sell these on Ebay for $50-$60. I picked it up for $7 across the street. It will go camping with us next week. 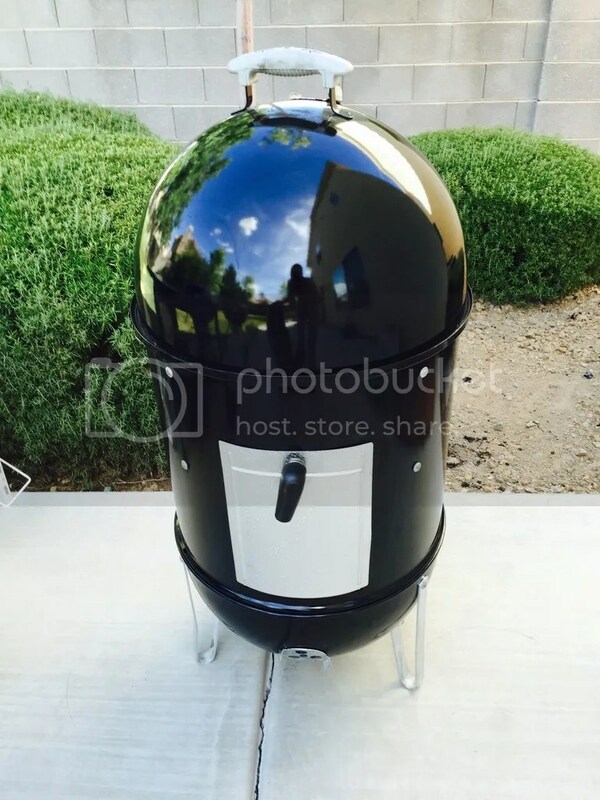 This one is not a kettle, but a Weber Smokey Mountain, which is a smoker. It is an amazing piece of equipment. I smoked twenty pounds of ribs on it a few weeks ago. Lastly, here are two that I own but am waiting for. 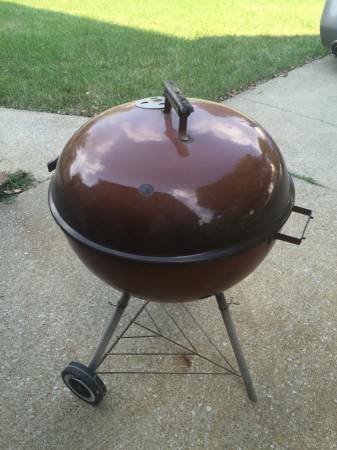 A 1980s era brownie sitting in St. Louis and a red grill from the 1970s that will be delivered to me next week. Overall, I have really found this to be a fun hobby. The lovely wife allows it as she said I don’t really spend money on much of everything, and yesterday I just sat out back watching the smoke gently curl from my copper grill as it merrily made twice baked potatoes for a fun Sunday night dinner. So, dear readers, I’ll ask you these two questions. First, do you have any questions about Weber grills or the glories of charcoal? Let me know. Finally, do you have any unusual collections? Share your odd passion!